What is Shedding in Weaving? In textile weaving industry, dividation of warp yarns into two parts for insertion of weft yarn is termed as shed and mechanism of shed is known as shedding in textile weaving. It is the first primary motion of weaving loom. it is done by means of treadles dobbies or jacquard, both in handlooms and power looms. What is Tappet Shedding in Textile Weaving? One kinds of cam to which a rotary motion is provided for the purpose of producing reciprocating motion in rods and levers by sliding contact. When the rod is to receive a series of lifts, with intervals of rest and thus forms a shed which is known as tappet shedding. A pair of shedding tappet is connected to bottom shaft or tappet shaft and two treadle levers is pivoted in the figure. Nose of tappets pushes continuously the anti-friction bowl on treadle lever when two tappets rotate or moves due to rotation of bottom shaft. As one end of the treadle lever is pivoted, the other end of treadle lowered. This treadle lever is joined with head shaft or frame by using chain or rope and heald shaft is joined with top rollers by rope. For this, the heald frame lowered with warp yarn. The other heald shaft moves upwards due to lowered of other heald frame. As a result, the warp yarn forms a shed and continuously shedding operation is performed. What Types of Tappet Shedding Used in Weaving? Various kinds of tappet shedding are in use in the textile industry. Those are constructed on two principles, where one is positive tappet shedding and another one is negative tappet shedding. What is Positive Tappet Shedding in Weaving? In woven fabric manufacturing industry, the positive tappet shedding provides both downward movements and upward movements to healds without the help of any additional mechanism. But pulleys and stocks and bowls are based on compensating principle. Here lifting and lowering is done mechanically. What is Negative Tappet Shedding in Weaving? 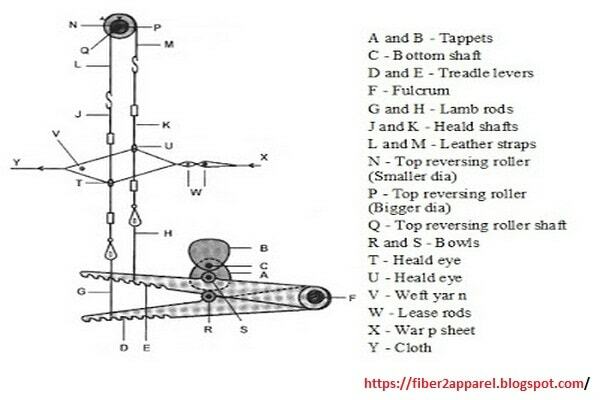 In textile weaving, all negative tappet shedding needs the addition of stocks, pullers and bowls, springs or dead weights to reverse either pulls the head down or lifts it. Here, lifting is done by mechanically and lowering is done by using spring. The ordinary twill weave and plain weave shedding tappets.